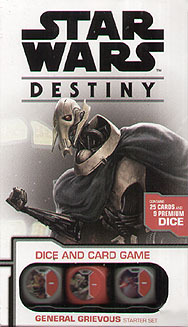 Take control of your favourite Star Wars characters and decide the fate of the galaxy! Upgrade your heroes using cards and dice, then battle your foes using the fast, and fun Dice Duel System. This pack contains all the dice, cards, and tokens needed for one player to start playing the game!